Volatile organic compounds (VOCs): human-made and naturally occurring high vapor pressure organic compounds. Common sources in the home include coatings, paints, and adhesives. Sulfur compounds: including hydrogen sulfide, a corrosive and highly disagreeable “rotten egg” odor. Diethylamine: Similar to cadaverine, an odorant released by decaying organic matter. Propionic Acid: A carboxylic acid with a pungent odor, byproduct product of amino acid by Propionibacteria. Isovaleric Acid: Source of foot odor resulting from the action of bacteria Staphylococcus epidermidis. Ethanethiol: Sulfur-containing compound with a powerful, distinct, and disagreeable odor. OdorKlenz technology can offer dramatically increased chemical neutralization capability and broader efficacy towards a variety of chemical classes. 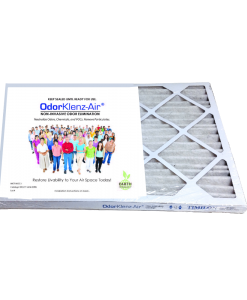 OdorKlenz technology can be incorporated into existing air handling systems (HVAC) and configurations, or used in portable/mobile air filtration systems. OdorKlenz technology does not release adsorbed chemicals or fragrances. OdorKlenz technology provide superior performance when compared to commercially available counterparts.